In our last eNews we introduced our very first Executive Director, Christine Reid. We’re happy to announce that Cynthia Young has joined our team as the part-time Trail Adoption Plan (TAP) Manager. Many of you know Cynthia already in her capacity as a North Shore mountain bike rider, coach and guide over the last decade. Cynthia’s role involves cultivating sponsor relationships and matching these sponsors with builders and trails under the Trail Adoption Plan in conjunction with the Land Managers. Cynthia will also assist with the permit application process and timely delivery of work reports. We’ve already seen terrific progress to-date, with a number of new sponsors keen to get involved along with our returning sponsors. We’ll also be working with Penny Deck, Martin Newman and Ben Humphreys to revamp our Trail Academy over the coming year. The present Builder’s Academy course will run throughout this Spring, with the new maintenance-focused version launching in Fall and a shorter, child-friendly curriculum created to support our expanding Youth program. Finally, Ryan Pugh will be joining us as the part-time NSMBA administrator. Ryan has been instructing and managing bike camps since 2011, with extensive experience in coordinating and implementing programs. Ryan will be supporting Christine by monitoring the info@nsmba.ca e-mail, creating social media and eNews content, event support and general administrative duties. I’m excited for 2017 and the great team we have in place! See you on the trails! A huge thank you to all the applicants for their interest in the 4 positions we posted last month. We’re excited to see the NSMBA evolve from its grassroots origins 20 years ago to a more formal and sustainable organization, reflecting the structure of other successful trail associations such as Evergreen Mountain Bike Alliance. The Executive Director role has been a long-term goal for our Board of Directors for many years, and we’re delighted to have reached a point where our funding is stable enough to commit to this. The NSMBA Executive Director is responsible for the leadership and management of the NSMBA organization according to the strategic direction set by the volunteer Board of Directors. The Executive Director will implement the vision and mandate of the NSMBA, will provide leadership in identifying priorities and objectives, direct staff and contractors, support committees and help to ensure the NSMBA’s financial and organizational viability. We’re happy to announce that Christine Reid (Tetrault) was selected for this role after a rigorous screening and interviewing process. Christine brings extensive experience in the North Shore bike industry, including managing a local bike shop and running the social media program for another. She is well-versed in relevant tools and systems and has a strong network among relevant stakeholders. Please join me in welcoming Christine to her new role! Happy New Year, and welcome to 2017 – our 20th Anniversary Year! I’m proud of what the NSMBA and all of our volunteers have accomplished in those twenty years, from developing land manager relationships and legitimizing trails to building a community of experienced trail stewards and biking advocates. We’ve revitalized our trail system and engaged local riders in regular events like The Fiver race series and our annual Gear Swap. This progress is reflected in our growing membership base: in the last five years alone, we grew from 66 members in 2011 to 1280 members as we closed out 2016. The sign-up rate for 2017 has been faster than ever, and we thank you for your continued support. We’re looking forward to an amazing year, with a focus on bigger and stronger community partnerships, a revamped website, our annual survey to better understand the needs of our members, an enhanced Youth program, improved volunteer engagement, a detailed trails & advocacy strategy, and, of course, a huge 20th Anniversary celebration party! I’m very grateful to be part of such a hardworking, supportive and talented group of people across the North Shore and beyond. And I’m excited for what 2017 will bring. The NSMBA Administrator position is to support the NSMBA Executive Director with tactical activities and tasks. Operate as a first point of contact for the organization as required by the Executive Director, answering general inquiries with accurate information, and directing specific inquiries to the appropriate party. Website content management; Social Media management. Event support as requested by the Executive Director and the Board. Collect data for and prepare the monthly newsletter, as needed. Create and update process descriptions in order to ensure that cross-function job completion is possible when a director is absent or otherwise temporarily disposed. Working knowledge of Google Docs and Drive. This is an hourly contract position, with a rate range between $15 and $20 per hour, commensurate with experience. The employee must have their own office space, as the NSMBA does not have an office. Employment Status: 8-20 Month Part Time Contract (including a 3 month probationary period). Depending on the candidate, roles may be combined and added to Trail Maintenance contract (at Builder rate) to make an equivalent full time role. The NSMBA Support Staff position is to lead the trails portfolio of the NSMBA according to the strategic direction set by the volunteer Board of Directors (the “Board”). The employee will implement the vision and mandate of the NSMBA by overseeing the sustainable trail management efforts of the organization. You agree to adhere to the policies & procedures set out by the Board. The position is structured in such a way that it can be filled by up to 2 contract employees. As such, the NSMBA may hire between 1 and 2 people to fulfill the multiple roles within the trails mandate. Coordinate and supervise TAP builders. Experience: North Shore trail knowledge, time management and ability to create and execute work flows. Proficiency with Microsoft Office Suite and Google Docs. Reports to President (VP in absence) and the Executive Director. Develop & deliver the Trail Academy and oversee the Shore Corps group of volunteer builders. Develop, review and update the curriculum for the Academy, Advanced Academy and all other trail education courses offered by the NSMBA. Coordinate event administration delivery of the Academy curriculum. Schedule and manage registration for Academy sessions. Facilitates Shore Corps volunteers working with TAP builders and adopters to increase volunteer leveraging. Experience: Preference for experience in teaching or delivering curriculums. Assist the Board and the Executive Director in answering trail related matters to our membership and the Land Managers. Monitor online trail databases and maps to maintain an up to date trail inventory for the North Shore Mountains within the NSMBA’s portfolio. Assist the Executive Director and Director of Grants in grant work with expertise related to trail management within the NSMBA’s trail inventory. This is an hourly contract position, with a rate range between $24 and $30 per hour, commensurate with experience. As work to deliver TAP and the Trail Academy is seasonal (spring and fall), applicant can negotiate additional hours to be filled with trail maintenance activities to total weekly hours equivalent to a full time position (40 hours). The employee(s) must have their own workspace, as the NSMBA does not have an office. The NSMBA is a voice for the mountain biking community of the North Shore. We protect and maintain the trails as environmental leaders, focused on sustainability through education and action. We develop trail networks that provide challenge and progression while fostering mountain bike culture and a community that embraces our sport as a positive force. The NSMBA Executive Director is responsible for the successful leadership and management of the NSMBA organization according to the strategic direction set by the volunteer Board of Directors (the “Board”). The Executive Director will implement the vision and mandate of the NSMBA, will provide leadership in identifying priorities and objectives, direct staff and contractors, support committees and help to ensure the NSMBA’s financial and organizational viability. You are committed to guiding and inspiring mountain biking on the North Shore, by offering direction to your staff, fellow mountain bikers, partners, and supporters; and to representing the mountain bike community to government, land management agencies, other trail user groups and other concerned parties. Operate as a first point of contact for the organization, answering and directing specific inquiries as required. Support the work of the Board by liaising with external organizations and following up with contacts as required. Oversee the efficient and effective day-to-day operations of the NSMBA using policies and procedures approved by the Board. Actively participate in the development of the overall strategic direction of the NSMBA with the Board. Supports the Board with Land Manager relations and meetings. Facilitate effective Board meetings by preparing reports, meeting agendas, proposing topics for discussion/review, and determine/initiate follow up actions. Assist the Treasurer and President in ensuring that the finances are well managed, and take shared responsibility for setting and maintaining an annual budget. Assist the Treasurer with financial data entry when required; payroll, invoicing. Oversee the administrative management of trail work, supporting the Director of Trails and President (VP in absence), coordinate work plans and builder’s hours management. Consults with the Board as needed regarding human resources plans and staffing activities. Assist Board of Directors in handling workflow and administrative processes surrounding future grant applications. Facilitate proposals, create documentation, ensures deadlines are met. Lead and oversee all communications, marketing and development efforts. Manage Membership Communication (surveys, newsletter content, and management of website). Collect data from the Board in order to prepare the monthly newsletter. Perform the Admin Functions on Trailforks. Working with all staff, coordinate the delivery of the organization’s programs and events. Co-lead and facilitate the Trail Adoption Program with the Program Coordinator. Provide project management/support to events, campaigns, and programs as directed by the Board. Create, update, and document process work flows for the significant recurring NSMBA events. Other duties & responsibilities as required. An undergraduate degree or equivalent. A minimum of 2 years of working for a non-profit, volunteer lead society. Trail building knowledge is required. Practical trail building experience considered an asset, not a requirement. The position does not involve any paid trail building work. A persuasive and passionate communication style with excellent interpersonal skills. Strong problem solving skills, organizational skills and attention to detail. Experienced in organizational management, with the ability to coach staff, manage and develop high-performance teams, set and achieve strategic objectives, and manage a budget. Experience in working with sponsors. 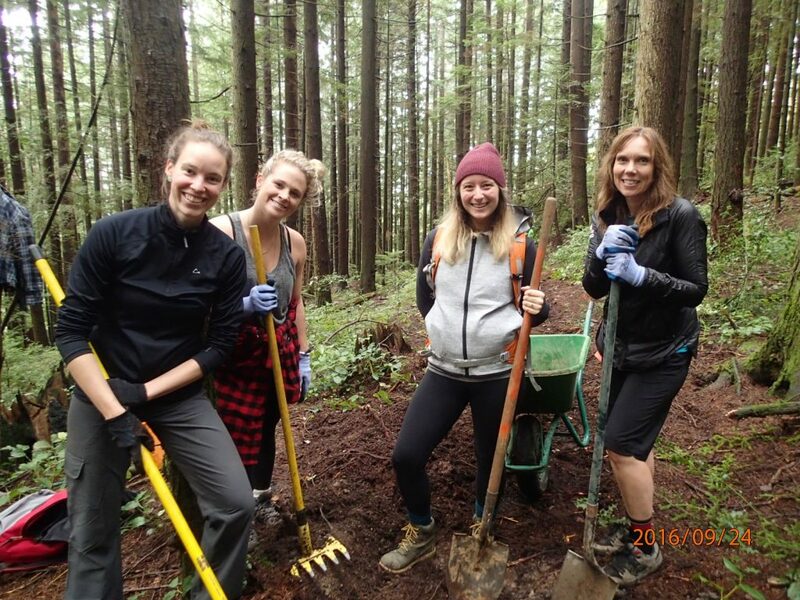 Experience in reporting: grants, trail work reports. Proficient in Word, Excel & Power Point. Data entry and bookkeeping considered an asset. Working knowledge of Google Docs and Drive is essential. This is a salaried position, with a range of $50,000 – 60,000 commensurate with experience. Must have the ability to work from an office space, as the NSMBA does not have an office.